The Star Alliance and the SkyTeam Alliance are battling over off-season fares in January, February, and March from Seattle to Barcelona and Madrid, Spain. Star Alliance: (Lufthansa, SWISS, Air Canada, United Airlines) - they are showing flights for as low as $465 CAD roundtrip including taxes. SkyTeam Alliance: (KLM, Air France, Delta) - they are showing flights for as low as $501 CAD roundtrip including taxes. You can also find flights from Seattle to Malaga, Spain (AGP) for $565 CAD roundtrip. The cheapest flights from Vancouver to Spain in these months are going for around $1100-$1200 CAD roundtrip. You can also try going to the Delta website, or the Air France website directly, and searching for the same destination and dates. one of the other cities in Spain. TIP #1: For the Star Alliance flights, look for the flights where the overseas legs are operated by Lufthansa or Swiss or Air Canada (better than United Airlines). Usually you can get a flight with one of these high quality airlines in at least one direction. TIP #2: Once your Momondo search completes, try sliding the Max Flight Duration slider on the left down to around 36, to filter out really long flights. You can also try selecting 'Max. 1 Stop' on the left hand side. Ideally, you should be able to find 1 stop flights with somewhere around 14 to 18 hours of travel time. You can also turn these into 2-in-1 trips and visit both Paris (or Amsterdam) and Spain for around $568 CAD including taxes. 1. Try looking for a regular roundtrip flight first, using the instructions above. It will help to first have an idea of cheaper dates to try. Change the Trip Type to 'Multi City' (not available on the mobile site). 4. Try using start and end dates that are similar to the regular roundtrip dates that you found. For the middle flight, you may need to use a date that is less than a few days from your first flight. If you try extending the middle date beyond a few days (say: Mar 14 to Mar 21 to Mar 28), it may bump up the price quite a bit. Another nice thing about turning these into 2-in-1 trips is that the flight durations may improve. You can see in the screenshot below that it's now a non-stop flight from Seattle to Paris, and a quick 1 stop flight on the way back. flight deals, seattle, sea, air canada, europe, spain, madrid, mad, western europe, klm, southern europe, delta, barcelona, bcn, lufthansa, air france, swiss, united airlines, malaga, agp, bilbao, bio, valencia and vlc. 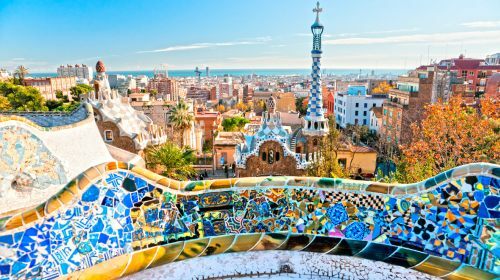 One Response to "Seattle to Spain (Barcelona, Madrid, Bilbao, Malaga, Valencia) - $465 to $535 CAD roundtrip including taxes | off-season flights"
Thank you so much, I've been waiting for cheap flights with oneworld on Delta and KLM for a while from Vancouver to accrue to my AA account!